Tsagaan Uvgun, the White Old Man of Mongolian mythology. 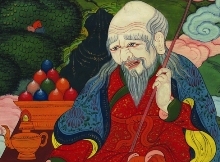 Tsagaan Uvgun is the White Old Man of Mongolian mythology, often depicted surrounded by the six traditional symbols of longevity (in Tibetan, “Tsering Nam Tuk”. These are: the divine peach tree, the conch-shaped rock, the crane, the crystal rosary, the pure stream welling up from a sacred rock, and the deer – which are said to be the only creatures able to locate the plants (or fungus) of immortality. In Tibetan, he is called “Tsering Tuk”, or the Bodhisattva of Longevity. In China he is Shou-lao. But wherever he is, whatever he is called, he is a supreme example of how to live in harmony with nature. What use is living for a long time, if we are not living in a beautiful place? A painting commissioned by Gandan Monastery in 2008, and painted by the respected Mongolian artist Mr. Dulguun, reinterpreted this image – popular throughout Central and Northern Asia - to encourage people to remember how powerful their role can be in protecting the land. In this new painting, now made into a poster and distributed to monasteries and schools around Mongolia, Tsagaan Uvgun is still there at the centre. He is an old man with white hair and flowing beard, living in a tranquil, beautiful landscape: the kind of place which human beings inhabit in their happiest dreams. And close to him are the deer and the water and cranes and the other traditional symbols of longevity. But also around him - helping create, perpetuate and protect the perfect landscape - are monks and laypeople. Some of them are doing a sacred sand offering to a stream and pouring it sweetly. Others are worshipping a sacred ovoo to protect the mountains – with the support of lay devotees. Others are going out into the landscape to do an animal liberating ceremony by reciting the appropriate sacred sutras for this event so that the animal can go with no fear from humans. In another scene, monks are performing prayers and pleading with the nagas of the trees to forgive those who cut them down. The tree-cutters themselves are shown making confessions: they have suffered unhappiness because the nagas have been angry. 1. Peaches, said to be the fruits of everlasting life. They represent the abundance of the natural world. 2. A pine tree, which being evergreen, is also a sign of long life: it represents how we need vegetation. 3. The water of longevity, with the eight precious qualities of being clear, cool, healing, odourless, soothing, delicious, light and soft. It represents the importance of pure, unpolluted water both for drinking and for sustaining the earth and its creatures. It comes from a rock that is in the shape of a conch. 4. The rock of longevity, which does not change: its fissures are often curved like the bends of a conch shell. Mongolians and Tibetans see it as a holy mountain, which must be prayed for and respected. This reminds us of the grandeur of nature, and emphasizes that humans are only a part of something greater. 5. Cranes, which are believed to be the most long-lived birds. 6. Deer, which are the vehicle of Tsering Tuk – who is sometimes shown riding a stag. Deer, like holy mendicants, are traditionally believed to sleep in a different place each night. In this painting the deer and the cranes are reminders of how human beings should respect the lives of animals and birds, in order to ensure a landscape and life that is in harmony. They can’t live to be old, unless we allow them to do so by refraining from hunting them and destroying their habitats.